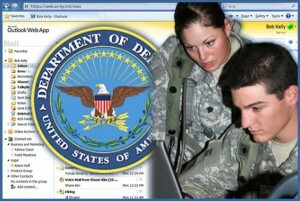 The Army successfully completed the bulk of its migration to DOD Enterprise Email in July 2013 and size limitations will soon be enforced for mailboxes. Courtesy graphic. WASHINGTON — Effective Oct. 1, the Defense Information Systems Agency, or DISA, will enforce existing Department of Defense Enterprise Email, or DEE, Service Level Agreement, or SLA, mailbox size limits, to lower costs and improve efficiency and Outlook start-up times. Each of the Army’s more than 1.4 million DEE accounts has a storage limit. Most users fall into the Basic class, with a maximum storage limit of 512 megabytes. Business class users, with an operational requirement for a larger storage size, have a maximum storage limit of 4 gigabytes. Previously, those storage limits have not been enforced. Even without strict enforcement, most Army users have stayed within their maximum allowable email storage. As of July 31, 2015, however, Army reports indicate that more than 75,000 Army personnel are storing more than 4GB of email. More than 7,700 user mailboxes exceed 10GB of storage each. That level of heavy use makes for a slow, inefficient and costly email system for both the individual user and the Army as a whole. Clearing out old, outdated emails is good practice for any user. But, what if you aren’t already in the habit? All users at risk of exceeding their size limits will receive auto-generated warnings when their mailboxes exceed authorized limits. Basic users will receive that warning if their mailbox exceeds 410 MB of storage, while business users will receive the warning if their mailbox exceeds 3.7 GB of storage. If an individual’s email storage exceeds its limit–512MB for basic users, and 4GB for business users– they will receive a second warning that account will no longer be able to send email until the extra emails are cleared out. If the email account continues to grow–beyond 700MB for basic users, or 4.6GB for business users–the user will receive the third and final warning that the account will also lose its ability to receive incoming mail. At that point, anyone sending email to the outsized account will receive a non-delivery notification. It is especially important to note that users can still store everything they were storing before, just not in their Outlook inbox. Additional email can be stored in personal folders as .pst files located on local drives or shared drives in accordance with local command policies. Find tips and strategies for reducing your email’s storage overload on the Army Enterprise Service Desk’s Customer Support website at https://esd-crm.csd.disa.mil/app/home/.